Born in December? Lucky You! Birthdays in December often take a back seat to all the holiday celebrations. Red and green seem to dominate the landscape. More Christmas cookies are consumed than birthday cake. But those of you born in December are very lucky to have some amazing blue birthstones to choose from–Blue Zircon, Turquoise, Tanzanite, and Blue Topaz. With so many choices, there is no reason to feel deprived. Zircon is a gem stone which comes in a wide range of colors. The most popular color is blue. Some zircons are so electric looking as to be almost neon. They have this great ability to refract light, so the stone’s color just seems to jump out at you. A lot of people get zircon confused with cubic zirconia, which is a manmade stone used as a substitute for diamonds. Zircon is a completely natural stone. It is often heat treated, as many gem stones are, to enhance the color and improve the clarity. But it is not lab grown. It’s mined in many places, including Cambodia, Sri Lanka, Tanzania, and Madagascar. If you want a birthstone that is mined in the United States, turquoise is your choice. A lot of turquoise is mined in Arizona, Colorado, and Nevada. Turquoise is often named for the mine it came from, so you’ll hear about Sleeping Beauty, Kingman, or Carico Lake turquoise. Generally light to dark blue or green, with or without matrix, this opaque gem stone is sometimes dyed to improve its color. Stabilizing material may be used, since turquoise is a relatively soft stone. Ask your jeweler if you want to know about possible enhancements. Tanzanite is the youngster of all gem stones. Discovered near Mt. 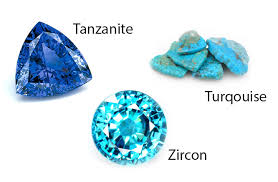 Kilimanjaro in the 1960s, Tanzanite is the fancy name Tiffany & Co. gave to the mineral, Zoisite. I guess I can’t blame them. Wouldn’t you rather buy something exotic-sounding than scientific-sounding? It’s a pleochroic gem, meaning that it shows more than one color at a time. You can see blue, purple, and violet. 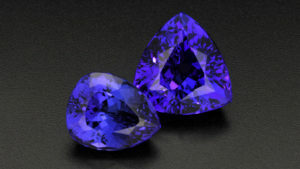 Almost all tanzanite is heat treated to improve its color, since most of it comes out of the ground brown. There is only one known source for Tanzanite, and it’s in Tanzania. Both Zircon and Tanzanite are fairly expensive gemstones, especially in large sizes. A great alternative is Blue Topaz. Topaz is mined on most continents, including South America, North America, Asia, and Europe. The gem stone is generally heated after irradiation to produce the blue color. Natural blue topaz is relatively rare. Most topaz is pale yellow, gray, or colorless. With enhancement, different shades of blue are possible–Sky, Swiss, and London. Sky blue is the palest and London blue is the darkest. So all you December “babies”, cheer up!! Life is good. 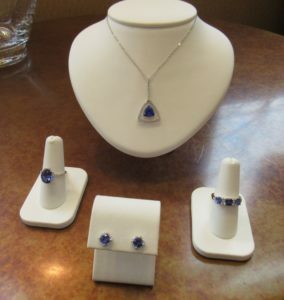 Especially if you get one of these beautiful blue gemstones for your birthday. 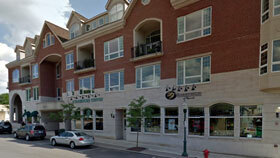 We have examples of all four at Dearborn Jewelers. Stop by and see them!